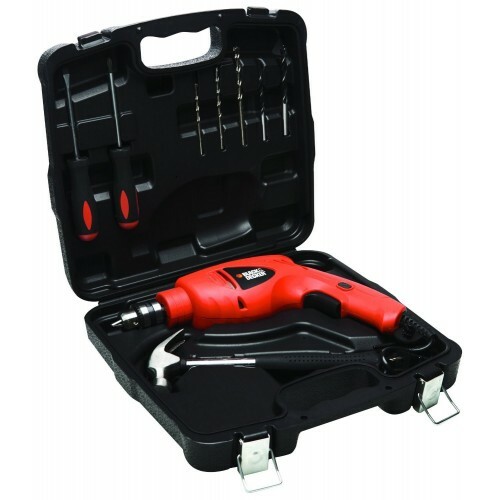 For those who like to engage in small construction activities at home and do repair works by themselves, this Black & Decker Tool Kit is the ideal choice. With a combination of some of the most functional power tools and hand tools, this kit is what you need to make your simple construction activities and repair works more convenient. This tool kit contains a power drill, a hammer, 3 masonry drill bits, 2 wood drill bits, a measuring tape and 2 screwdrivers. The power drill can be used for drilling in wood and concrete with the suitable drill bits. For easy handling, this tool is ergonomically designed and has a pistol grip handle. To ensure its safety and durability, this power drill has an efficient cooling system. It is easier to change the drill bits as this tool uses a keyless drill chuck. You can shift between impact and drill mode according to the job and the type of material you are drilling. For easy use and to help you drill precisely, this power drill has a lock-on button. suitable for home use & DIY Multipurpose drilling . Equiped with a high quality keyed chuck Lock on button for greater comfort.